The Upper Peninsula (UP) State Fair took place August 17‒23 at the Upper Peninsula Fairgrounds in Escanaba, Michigan. Michigan State University (MSU) Extension has always had a role at the UP State Fair, assisting with various aspects including helping judge events. This year, our staff focused on positively communicating about our programs and interacting with fairgoers through our display in the Miracle of Life Building. Participating staff members represented each of the institutes and a majority of the counties in the UP. The display, which was staffed for the entire time of the fair, included a variety of MSU Extension program banners and several tables with information and handouts representing all institutes. Gov. Rick Snyder attended the Governor’s Luncheon and toured the Miracle of Life Building. 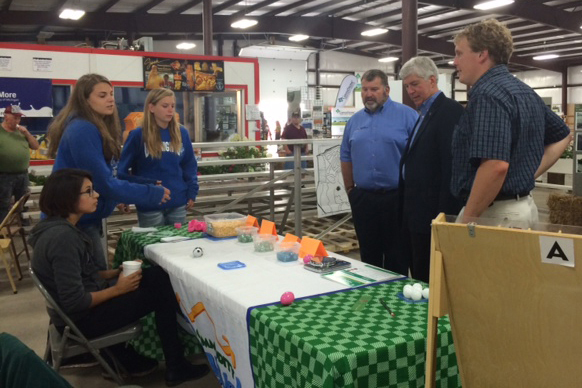 He and Rep. Ed McBroom visited the MSU Extension display and the 4-H Commodity Carnival activity table. Staff members, volunteers and 4-H members got a chance to interact with both officials. left to right: Rep. Ed McBroom (108th district); Nancy Victorson, Michigan State University senior Extension educator ‒ Luce County; Gov. 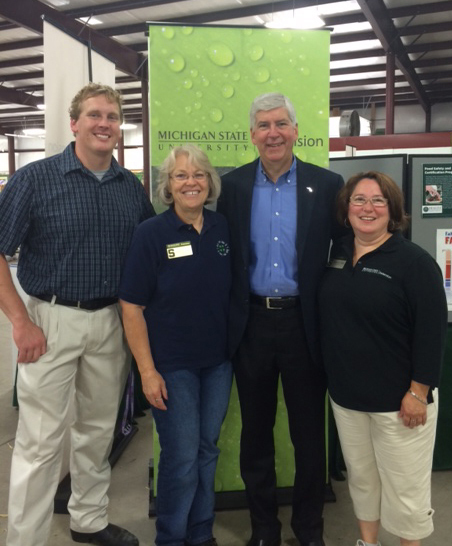 Rick Snyder; Michelle Walk, MSU Extension educator ‒ Chippewa County pose for a photo Aug. 20, 2015, at the Upper Peninsula State Fair, U.P. State Fairgrounds in Escanaba, Mich.